ZAFARI is a charming animated series about being different. 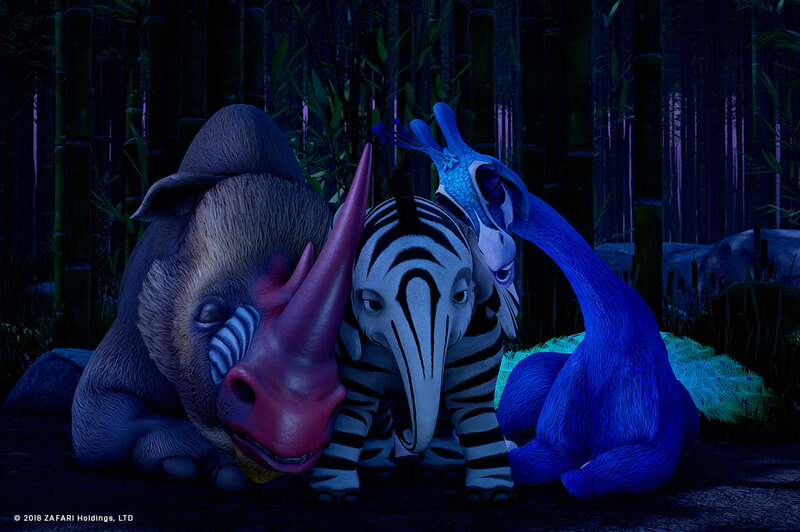 It revolves around a cast of quirky critter characters who are born with the skin of other types of animals. NBCUniversal DreamWorks picked up the show for a 52-episode run, with each 10 minute episode weaving bite-sized tales of friendship that encourage kids to comfortable with who they are and accepting of others who might be different. Much like the way its unique premise makes it stand apart from other shows, ZAFARI is the first episodic animated series of its kind to be fully rendering in Unreal Engine. Speed and cost savings were important factors, says Dozoretz, who was also looking for subsurface scattering, ambient occlusion, vector-based motion blur, and the ability to produce great water and visual effects, among other critical rendering needs for the production. “‘Digital Dimension, using Unreal, has stepped up to all of them,” he adds. Producing feature film quality work at episodic television speeds and budgets is no simple task, but Digital Dimension was able to hit the mark with the help of Unreal Engine’s real-time rendering technology. With a fast-moving episodic project like ZAFARI, rendering can be a big stresser — especially when trying to minimize errors and keep production moving forward on schedule. Read and see more about this groundbreaking case study at the UnrealEngine website.